Dootoodootooooo! That's the sound of trumpets, in case you didn't know. I'm just so excited to share something huuuuge! My dance magazine debut ran this weekend! 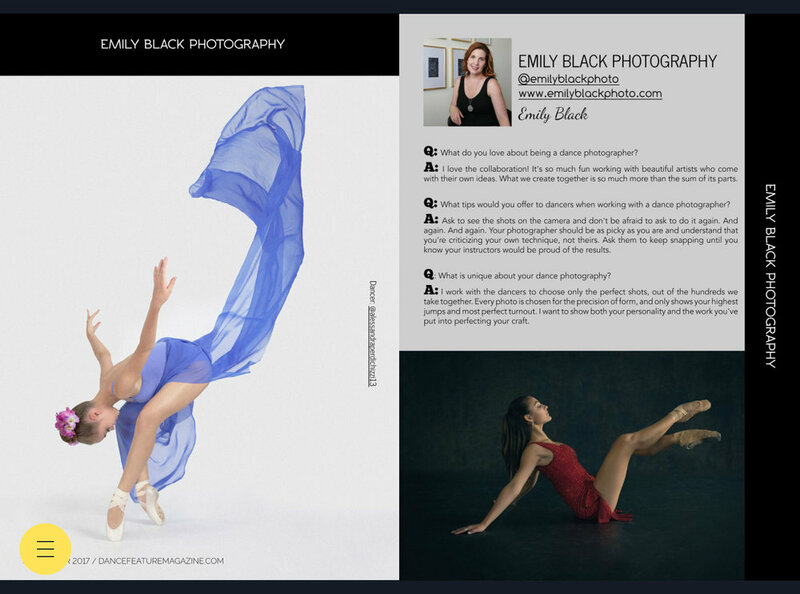 Dance Feature Magazine has a two page spread with me as the Featured Photographer for the March Issue! They're a relatively new publication that features industry professionals and up-and-coming dancers. Dance Feature Magazine has run a few of my photos on their Instagram page in the past, and I'm so excited that they chose me—and more importantly, my dancers—for the full magazine. They asked for a handful of photos, from which they chose two. The talented models are Avery Alley and Maddie Medina, both ballerinas from Houston. I'm so glad their hard work is being rewarded! Check out my spread here, and please visit dancefeaturemagazine.com to download the full copy. Newer PostA Birthday Party, a Handstand, and All. Those. Shoots.